Paella pans must be wide, round, and shallow to ensure that the rice is cooked in a thin layer. It is important to spread the rice out over the entire base of the pan, as this is where most of the dish's flavor resides. Many paella cooks prefer iron pans to stainless steel ones, thought both work quite well. If you do not wish to invest in an expensive pan, a shallow casserole should also be effective. Those favoring the traditional iron pans must be careful to avoid the iron's inevitable rusting. To avoid this, boil a sprinkling of vinegar and water in the pan before it's first used, then rub the pan's surface with olive oil after it dries. It is also important to use the proper-sized pan. 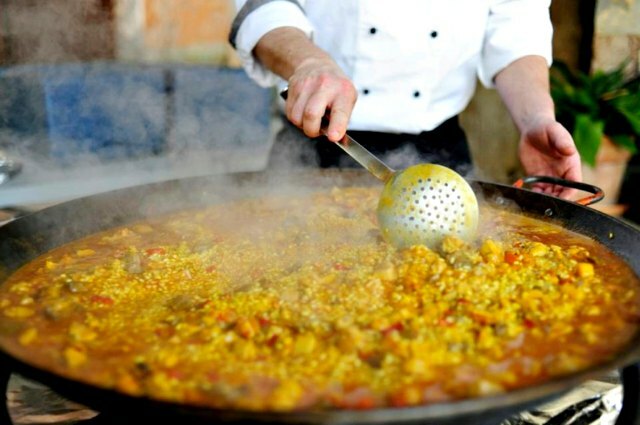 You'll be able to find almost any size of paella pan, for example a small 10-inch pan will contain enough rice to serve from two to three people; but larger paella pans also exist - some, made for festivals, are as wide as 13 feet, and can feed hundreds of ravenous festival-goers! 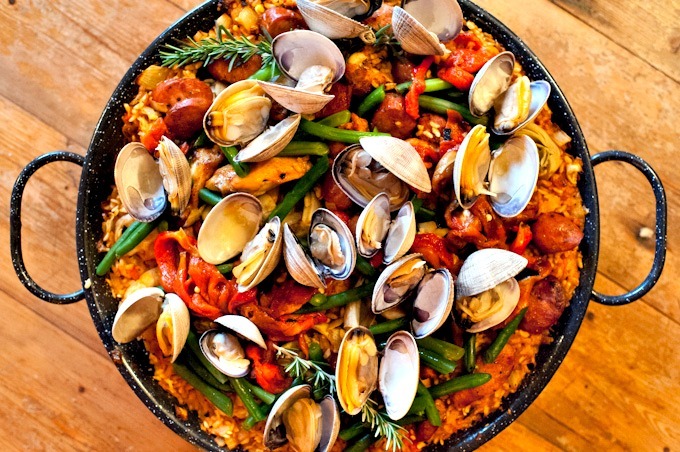 Although paellas were traditionally prepared outdoors over an open fire, those preparing paella in modern kitchens can still achieve delectable results. But there are a couple of points to bear in mind. First, an indoor cook will need to use a large heat source as the paella pan itself. If the largest burner on your stove is too small, straddle the pan over two burners, rotating it regularly to distribute the heat evenly. If need be, the paella may even be cooked outside on a large gas or charcoal grill. If, however, the only heat source available is smaller than the pan, stir the rice at least three times during the first 15 to 20 minutes of cooking, then leave it undisturbed for the remaining cooking time. Second, to create a paella that tastes of the outdoors, one must simulate the socarrat, which is one of the most delightful results of cooking paella over an open fire. One taste of socarrat, the crisp, golden rice that sticks to the base and sides of the pan, and one will achieve paella nirvana! Although socarrat naturally results only when the paella is cooked over an outdoor flame, indoor cooks can create this delicacy by turning up the heat in the final minutes of cooking until the rice lining the bottom of the pan turns crisp. Paella should not be served in individual dishes but, as the Spanish still do - straight from the pan. The prepared dish, still steaming, is set in the middle of the table, and diners eat communally from the pan. In Spain, what you eat is only secondary to the people with whom you eat. No meal is complete without convivial company and conversation, and a paella, shared with friends, is the perfect dish for this!